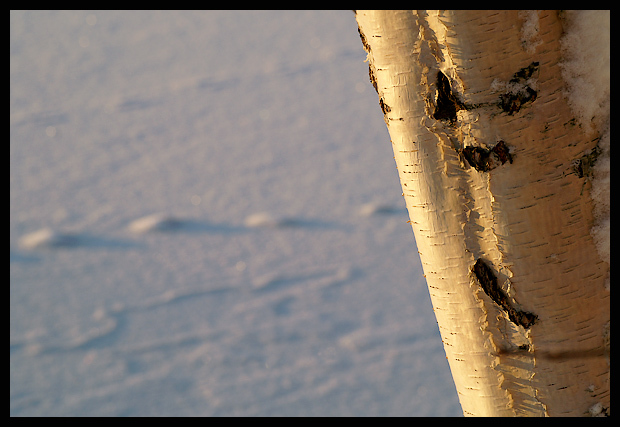 A birch in the sunset. Backdrop from snow on frozen river. The four humps in the snow are pawprints from a cat or a fox. Beautifull colors and strong contrast! naturals are the way to go. Great focus, I like the composition, but the shape doesn't really stand out as the subject of the photo. Sorry, it just didn't move me. am i looking at the ground or the tree? I like the light and focus here. Pretty image. I like the texture of the tree, but there seems to be too much empty space in this photo. Proudly hosted by Sargasso Networks. Current Server Time: 04/20/2019 03:07:00 PM EDT.